If you're looking for foods from Myanmar, look no further than Fuji Store. 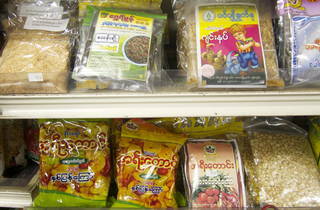 This import grocery offers favourites such as lahpet (a type of fermented tea regarded as a Burmese national delicacy), deep-fried mixed nuts and Burmese tobacco. You can also stock up on Thai ingredients and halal meats at the second-floor shop, which can be found in an apartment block a couple of minutes' walk from Shin-Okubo Station. If you're not in the area, Fuji Store also has a branch in Takadanobaba.